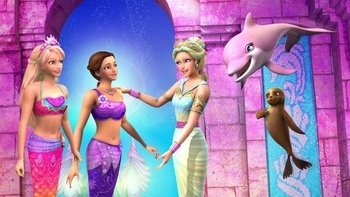 Barbie in a Mermaid Tale 2 is a Film programme that first aired in 2012 and has been classified a U certificate. A member of the royal family must go to 'Aqualia every 20 years to perform an ancient ritual ensuring the safety of the kingdom. The stakes are higher this time when an evil mermaid returns to take control of the throne.